1. Mash blueberries in a bowl using the bottom of a clean plastic cup or a large spoon. Add sugar, lemon juice, salt and gelatin or tapioca. Stir until well mixed. 2. Using a pizza cutter, cut off four sides of the round pie crust to form a square. Then cut into thirds, turn 90 degrees, and then cut in half. You'll be left with 6 rectangles. Do this with the second pie crust as well until you have 12 total rectangles. 3. Spoon about 2 tbsp of the blueberry mixture onto 6 of the pie crust rectangles. Top each with another rectangle of pie crust. Then, using a fork, press the edges together, all the way around the edge to seal. 4. Using the fork, poke three rows of holes in the top pie crust at a diagonal. 5. Using a toaster oven or conventional oven, bake on a piece of foil or a lined baking sheet for about 12-15 minutes at 350˚ or until golden brown. Please note: temperature may need to be increased when using a conventional oven and cook time may vary. 6. 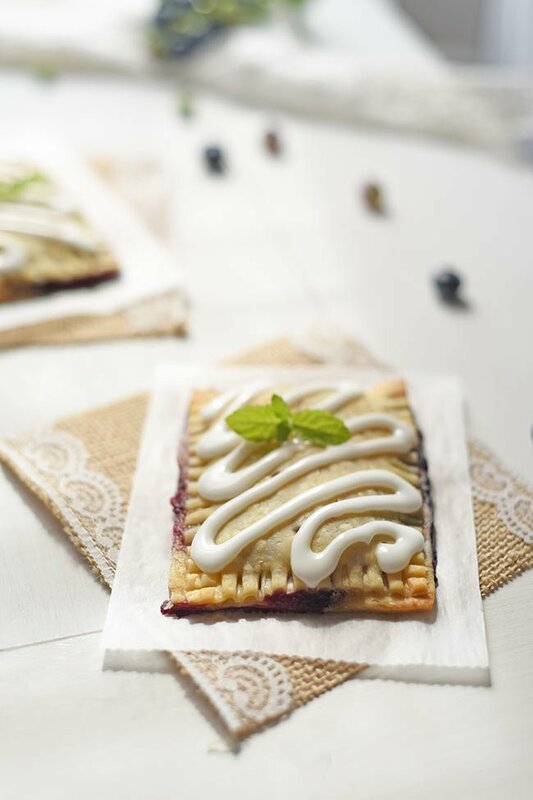 While the blueberry toaster tarts bake, prepare the icing by mixing powdered sugar with milk. Icing should be very thick so that it hardens when cool. 7. When toaster tarts are done baking, let cool then add icing. You can pipe the icing on by putting the icing into a sandwich bag and cutting a small hole in the corner, then squeeze it out in a zig-zag motion on top. 8. Enjoy fresh and warm or you can freeze and reheat these! A few days ago, on Instagram, I asked you guys what I should make—homemade blueberry poptarts or a blueberries pie?? You guys voted and the results were exactly 50% / 50%! Ha! So, since I couldn’t decide either, I made both. But since I have already posted a recipe for puff pasty blueberry pie, I’m just writing up the recipe for the poptarts here. Fresh picked blueberries are the best! In case you’re not following along with me on Instagram (follow here! ), then what you don’t know is earlier that day the kids and I picked a GIANT bucket of blueberries. We’re fortunate enough to have a cute little blueberry farm right down the road from where we live so we try to get there at least once a summer. Fresh blueberry are so key to making a good pie, so if you can find the time, I recommend picking your own, or at least buying them local so that you know they’ve been picked recently. Blueberries are just better baked. Okay, so the funny thing I have to admit here is, I’m not a huge fan of blueberries all that much. I don’t really like them in smoothies, they are alright by themselves but I don’t crave them like I do with blackberries, peaches, raspberries or strawberries. But put those babies in a pie, and that’s where they come to life. My favorite kind of pie, hands down, is blueberry. So I gotta tell you though. There is a trick involved. I’m just gonna go ahead and tell you my secret… When you’re baking with blueberries, they are best when they’re tart. You want to pick them early to get them when they are perfectly tart. A little bit sweet, but a lot tart. Like a sweet-tart! That little combo is so famous because it’s a flavor profile our palettes enjoy. The sweet/sour contrast is a flavor you can get it in its most purest form, in a blueberry. How cool is that? But there’s actually another part to my secret. Lemon. I add lemon when I bake with blueberries because even if the blueberries are tart, I like them even more tart so that sweet-tart contrast really pops in your mouth. A little lemon juice works wonders. Since I mentioned juices, here’s another things. A blueberry pastry of any kind is typically going to come out pretty runny if you don’t add some sort of gelling agent. Which I totally thought was a term I just made up but I googled it and it’s real. Go me. I actually sound like I know what I’m talking about. Anyway, you need something that will thicken all those juices so that when you bite into your pastry, or in this case, your blueberry toaster tart, your blueberry mixture will be nice and gelled and not all runny. Learned that from experience. While blueberries have some natural pectin built in, you still need to add a bit more to really get it to firm up, especially since you’re going to be adding a little lemon juice. Now, you could add lemon zest by just shaving off a little of a lemon rind into your blueberry mixture. The oils in the rind work to add a beautiful lemon flavor. Try that if you’re a little bit of a neat freak and you’re worried about blueberry filling oozing out the sizes of these tarts. I personally prefer the taste of lemon juice and don’t mind a little bit of ooze. Your choice. Experiment and see what you like best! Alright, I got side tracked with the lemon talk. I want to go back and tell you about some different gelling agents I’ve tried. I’ve used tapioca pearls—instant tapioca since this doesn’t bake that long and you don’t want a grainy blueberry filling. You can also use tapioca flour which is more fine. I’ve used gelatin as well and that works quite well. For some reason I have a hard time with pectin. I haven’t been able to get that to work as well but you should be able to use that per the package and get a nice gel going on. I think the problem for me is I always want to use less sugar than what the pectin needs and it doesn’t end up gelling that well. So tapioca and gelatin are more preferred choices. Gelatin has some health benefits but it is an animal product so if you want a vegan or vegetarian option, tapioca would be a better choice for you. 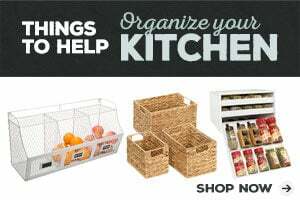 Don’t have gelatin or another gelling agent on hand? Don’t let that stop you. 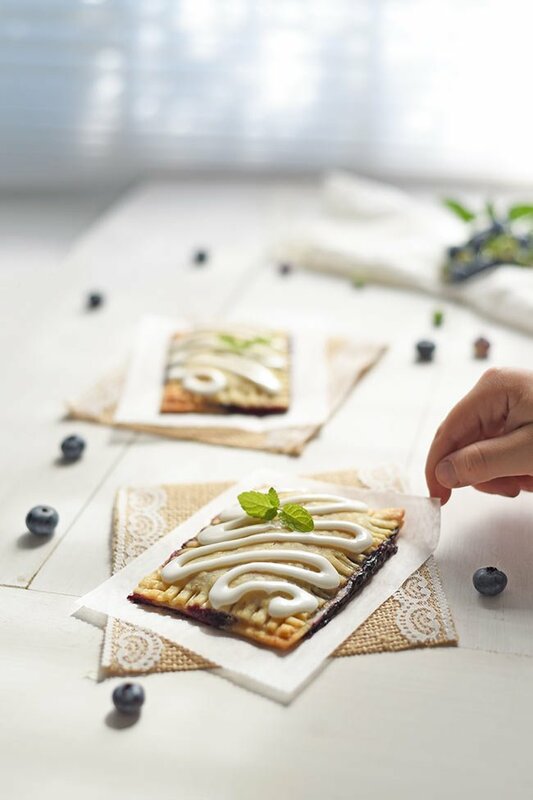 There’s so little blueberry filling in these homemade poptarts that it’s not a big deal. It’s really more important if you’re making a blueberry pie. with a LOT of blueberries because then it does get really juicy. Alright, finally, here are some tips about the cooking process for these poptarts. First, since blueberry season falls in the summer, and I don’t like to bake in the summer if I don’t have to, I like to use the toaster oven to make these. However, you’ll have to do multiple batches. So, up to you, but you can bake these tarts in any kind of oven. You’ll want some kind of liner for your baking sheet. I use parchment paper, or if I’m using the full size oven, I use my silicon baking sheets. It’s NOT as hard as I’m making it sound. These are super easy! Just want to be sure I’m answering any questions you might have. This is a great way to use up leftover blueberries since you don’t need much! 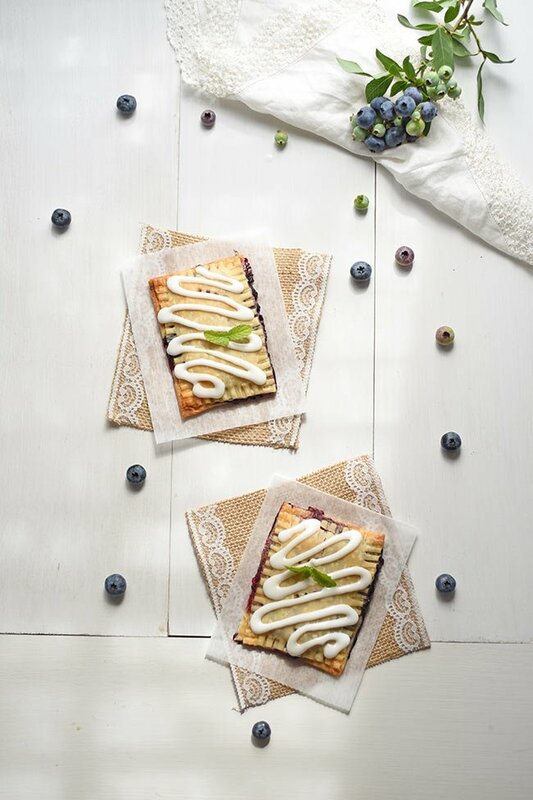 This homemade blueberry poptart recipe was featured on South in Your Mouth’s Weekend Potluck.